My 2002 Honda Passport has been a great purchase in my opinion. I have owned my Passport since 2003 and have enjoyed the comfort inside the cab. The seating is comfortable and the cab is spacious. The interior material is of high quality and holds up over time. The reliability has been exceptional, I have never had to worry that I would have random problems, the vehicle runs well and smoothly. Gas mileage is not as good as many of the smaller cars, however the vehicle is a V6 and the fuel economy is quite good for the amount of power the vehicle has. The trunk compartment opening is huge. The window and door in the back open separately so the owner can opt for a quick open by opening the window only, or a large trunk access by opening both the window and door which allows for extremely large items to pass through easily. The rear seats fold down for even more room in the trunk area. I once fit an 8' picnic table in the trunk using the fold down seat option. 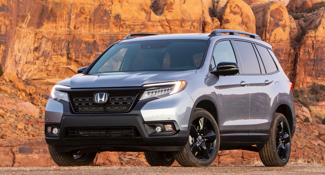 The body of the Honda Passport is well made and sturdy, the paint shows no sign of chipping or fading. The stereo and speakers are high quality, the cd player port holds one disk, but there is easy transition between CD, Radio FM, and Radio AM by using the buttons on the front without having to eject a disk that is playing. I have had the Passport for 13 years and have had small issues like the motorized window becoming stuck. The vehicle's air conditioning system had worked well until about two years ago, since then I had to replace the blower on the A/C and after about a year the replaced blower went out again. One great time we had was a kayaking trip. We loaded up our kayaks on the roof rack and headed out to the springs which are about an hour away. Because the roof racks enabled us to load the kayaks on top we were able to fit our tent and supply into the large trunk and head off for the weekend. It was such a great time and we loved being out in nature with friends and family. The best feature about the vehicle is the comfort of the ride, seats are well cushioned and deep. Seating materials are sturdy and well made. When riding the vehicle is heavy enough to glide nicely even when the road or terrain isn't smooth. Another of my favorite features is the roof rack, we kayak often and find this rack an easy to use addition that helps greatly with transporting large items without the need for a hitch. The main negative thing about the vehicle would be gas mileage. I drive far for work and find that I spend more in gas than my friends who drive smaller, lighter cars. 1997 Honda Passport - Magnificent beast. I bought my Honda Passport from a junkyard for $500. I've put barely any money into it, and the old magnificent beast keeps running and it is two years later. It is not pretty to look at and has some dents and dings, but overall, it looks mighty fine for a classic that has never been fixed up. I have issues with the heater. Specifically, it won't run unless it's set to the highest setting. Also, when the heater is running, it screams like a Banshee set forth from the depths of Hell. Speaking of which, I could probably drive through Hell in the old Passport, and it would look better on the other side. The "sun" roof is one of the special areas that have been 'retouched' with the loving hand of duct tape. It has never worked, but I could well imagine it working and me peering into the skies through it. Overall, for the price of this old used truck, I have easily gotten more than what I put into it in the two years I've had it. Driving out to take pictures in the morning with my wife and dog. We moved to another area where the weather was far colder. My heater only works on the highest setting so this was not a problem. The truck kept us warm. It had no trouble starting back up when we got out to take pictures. It went down any icy road without a problem. It seemed like a warm hideout from the cold weather. The top feature of my Passport was its inexpensive cost. It's rugged with low costs to maintain. It's roomy. The heater doesn't work right and whines. The electrical system seems to be a bit flaky as the headlights sometimes randomly turn themselves off when I'm driving, especially when it's very dark and there is oncoming traffic. It has a slightly odd smell. 1998 Honda Passport - A real workhorse of a SUV. I am getting close to 100K on my 1998 Honda Passport LX. The standard leather is hardly showing any signs of wear. Traveling over even rough roads with the smooth shifting 4WD not a rattle to be heard. This little workhorse is truly built like a little tank. I was living in Phoenix and had my car at the time totaled. I knew I was moving to altitude in Colorado so I picked out this little gem. I'll always remember since this was my first 4WD vehicle and we got a little over a foot of snow soon after I arrived. I took her out and the snow was up to the windows and this little tank just pulled me through the drifts with lots of power left. I'll never forget the "Rocky Mountain High" I felt on that Christmas day. The 1998 Honda Passport LX is truly a wonderful little SUV. Handles even the toughest conditions with a really smooth 4WD when you need it most. Good viability and excellent traction on those slick roads. Handles like a dream and the inline six gives you plenty of power. Plenty of cargo room for those outdoor explorations. The back seats fold forward to give you more room in needed. A few of the things that are sometimes a challenge with the 1998 Honda Passport LX is a very long turning radius. Gas mileage at 19 mpg isn't great but is understandable because of the weight and 4WD. Handling at low speed is a bit rough. At low speeds it does handle like a truck with manual steering.